Whitestar Enterprises restored the 100 year old Paisley School in 2003, repairing and refinishing all of the existing plaster, as well as surface reinforcement of damaged areas. “It’s been a real eyesore for everyone for a long time,” said Bill Wurtz, principal and superintendent of Paisley School. Whitestar worked closesly with architects to oversee the restoation, and were highly involved with window replacement, and the school district. Restorations like this involve combining proper details and materials to keep the initial design of the building and ensure a long-lasting project. 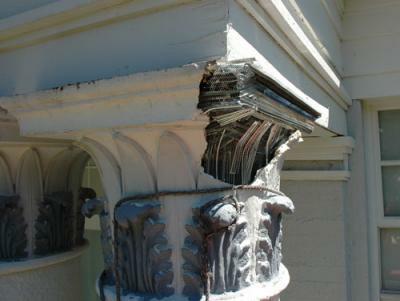 Surface reinforcement was necessary in all areas of damage iin order that materials applied over it would be sound. Hand carving into the wet plaster was required to reproduce the original ornamental details.